On Christmas Day 2013, Ilse and James’ beloved three-year-old daughter Georgia collapsed with a fatal brain aneurysm. Read how they turned this devastating tragedy into life and hope for six people by donating her organs – and are now helping to raise vital funds to save more through a new song released this week. Georgia was literally a ray of sunshine. There was a quality about her which just brought light and happiness to the people that she met. For her age she was incredibly bright (in all senses of the word) and was incredibly sensitive towards other people, as well as being really engaging and funny. She had a very kind spirit and would reach out to people irrespective of age and just somehow make them feel better and put a smile on their face. She had an adventurous nature and loved going on long walks (again, even at her young age) with her family and beloved dog Pepper. 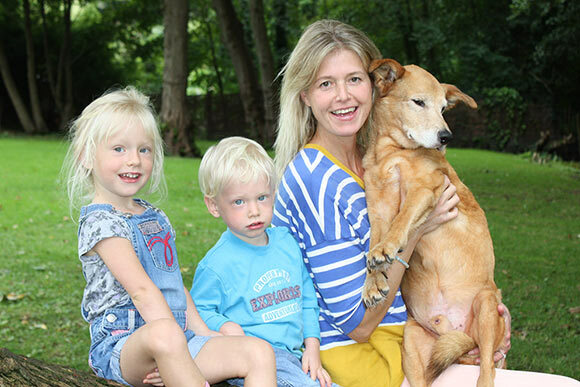 Georgia absolutely loved animals – one reason why Fisher’s Farm Park was so special to her. She loved to play with her dog as well as the rescue hens and ducks in her garden. She was very helpful and loved making people feel better. 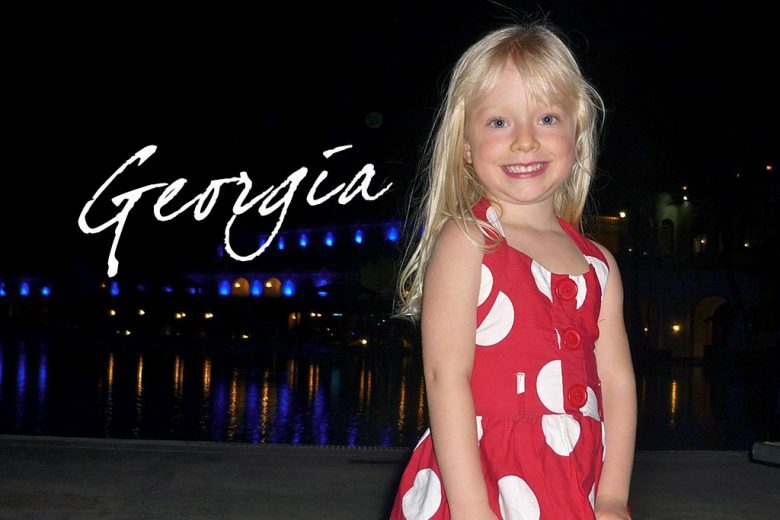 Georgia had lots of friends – she was really gregarious and really loved to share her happiness with her little friends. Georgia loved books and stories and was a really popular member of her pre-school class in Bramley. Georgia also loved music – of any genre. She loved to sing and dance with me, with her papa and her little brother Joshua – in fact on the Christmas morning when she died, Georgia had been singing and dancing with me and celebrating Christmas with us in a really happy way. How and when did she die? On Christmas Day in 2013, we were on holiday in Sharm-el-Sheikh, Egypt. We had such a lovely morning, singing and dancing, and Georgia and Joshua played for hours in the pool. Georgia suddenly exclaimed “Mama, MAMA” and collapsed into my arms. She became very limp and struggled to breathe. I looked and shouted for James who had gone off to some swings to play with Joshua, who immediately realised that something was terribly wrong. James followed me with Joshua after I carried Georgia in my arms to the hotel and then into a taxi to the Sharm-el-Sheikh International hospital. By the time that Georgia was attached to the correct medical equipment it was clear that a catastrophic event had occurred and Georgia’s brain had stopped responding. We were finally able (after desperate attempts) to get Georgia airlifted and re-patriated to the UK where she was rushed by ambulance to the Thomas Cook Children’s Critical Care Unit at King’s College Hospital, London. Georgia’s official time of death was New Year’s eve. How did you come to the difficult decision to donate her organs? I have always felt very strongly that if one is prepared to take an organ for a loved one who is in desperate need, then one should be prepared to consider donating. However, this decision is far easier to take when considering one’s own mortality. When the organs in question belong to your own beautiful child who looks like she is just sleeping and you are in a state of complete and utter shock and devastation, while she is on a life support machine which has to be switched off – it is a completely different decision to make. However, Joshua was both the strength and the inspiration for the decision. If he needed an organ and would die without it, we would accept an organ in an instant. And by that same token we felt that Georgia’s untimely and shocking death should not be completely in vain. Do you know who her organs have helped? We knew that as soon as the life-support machine was switched off, Georgia would be taken into a theatre room where her organs would be removed and then immediately used in a baby and a teenager, who were awaiting transplants. Another teenager and a new born baby were saved by Georgia’s organs. Furthermore, Georgia’s eyes gave sight to two young men. In total she saved four young lives and gave the precious gift of sight to two men. By the time of Georgia’s funeral, we knew that the organ recipients were out of intensive care and were doing well. Georgia gave the most precious gift possible – her life to save others. How has this gift of life and sight helped you to deal with the loss of Georgia? Nothing will ever heal our hearts and the terrible pain, grief and utter sense of loss that we have experienced since Georgia died. We will have to live without our beautiful daughter forever. The only thing that brings us any sense of comfort is that our daughter’s death was not completely in vain. She did the most amazing thing possible – she gave life to others so that other parents could be spared the appalling grief and anguish with which we live on a daily basis. You have since worked to raise awareness of organ donation. What would be your message to other parents in your situation? It is not a conversation that should be discussed whilst in shock and utter devastation in a hospital. I think that as a family, if you know what your wishes are then it is not something which could cause deep anguish, at an already devastating time. It is worth mentioning that as a parent you still have the right to stop the procedure right up until the last moment – giving you the sense that you are still in control and you are able to change your mind if you suddenly cannot bear to go through with it. It is estimated that three people die every day while awaiting organ transplant. This figure could be greatly reduced (if not eradicated completely) if only every person were to consider donating their organs in the event of their death. Would it not be amazing to give someone else the gift of life as our legacy after death? You also raised almost £25,000 for PICU at King’s College Hospital, where Georgia was repatriated to. What will the money be used for? The money will go to the Georgia Sandy Fieldsend Fund and the Thomas Cook Children’s Critical Care Unit of Kings Hospital (KCH). Thomas Cook Critical Care is a pioneering volunteer programme, which has trained and supported over 1,000 volunteers to help staff and improve patients’ experiences of being in hospital. The £1.8 million refurbishment of their world-leading Children’s Liver Unit. Their CT scanner is faster and has a higher resolution than any scanner in Europe. The research they’re doing on lung disease will be used to tailor individual treatments and improve outcomes for patients who, on average, have a life expectancy of two to three years. Their areas of specialisation include paediatric medicine, diabetes, blood cancers and sickle cell disease. They are also a major centre for heart and brain surgery, as well as foetal medicine. They also provide people with life-saving treatment, 24 hours a day, seven days a week. And their liver unit is the best in the world. This week you released a song in memory of Georgia. How did it come about? One of Georgia’s weekly activities was attending a Church Toddler Group in Bramley. Two local teenage girls (Sophie and Ellie Bokor-Ingram) helped out every school holidays – they had known Georgia since she was tiny, and Joshua before he was born. The girls absolutely adored Georgia and became great friends. Georgia called Sophie and Ellie her “Big Girls” and she absolutely loved them. When they heard the news of Georgia’s collapse they were absolutely devastated and rushed with their mother Kate and other friends from the Toddler Group up to KCH to say goodbye to Georgia. In their young lives they had never experienced shock and loss on this level. They were both utterly overwhelmed with grief, as they loved Georgia like a little sister. Sophie’s reaction to Georgia’s untimely and tragic death was to write a song. She sat at the piano with her sister Ellie and composed the melody to go with the words she had written. This was not ever meant to be heard by anyone else – it was simply their way of coping with the enormity of something which they could not otherwise express. At Georgia’s funeral, we wanted people to read stories or poems which had been special to Georgia, as she adored books. Kate told me that Sophie and Ellie had composed a song and I asked if they would perform it. On the 11th of January 2014, the girls felt absolutely overwhelmed with sadness, and they did not think that they would be able to do it – but they did, for Georgia. It was a very heartfelt and fitting eulogy, from two amazingly talented young girls, to their gorgeous little friend Georgia, who so loved songs and music. The song was then recorded at Ellie’s school so that a CD could be made and sold locally (as an additional fundraiser for the Georgia Sandy Fieldsend Fund) to friends who had been touched by the song at Georgia’s funeral. Through a freelance journalist, Fiona Locke, and Julian Close (a top music executive), I was introduced to a well known music producer Ian Curnow, who offered to make a professional recording of ‘Georgia’s song’ with Sophie in Strongroom studios, in London. Then through my friend Lucy, I was introduced to Andrew McKay (Creative Director), Jamie Hobbis (Director of Photography) and Dan Moran (Colourist at Smoke and Mirrors). They produced an incredibly powerful and beautiful video to go with ‘Georgia’s Song’. 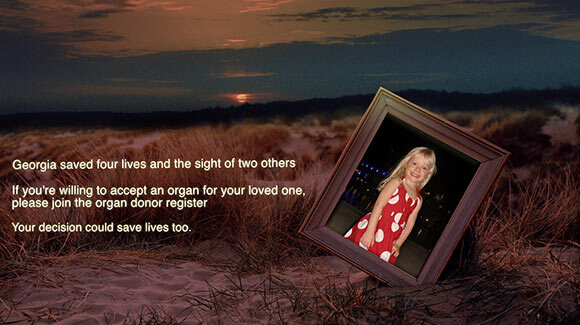 I, of course, wanted Georgia’s footage in the video, as well as a powerful message at the end – raising awareness of the importance of organ donation. What have you learned in creating the song? The creative side of helping to decide the content, look and feel of the video. Doing my own PR to get radio, TV, newspaper and magazine coverage. Learning how to post on YouTube and Twitter. Giving organ donation awareness talks in front of a room full of people and students at schools. Moving into the future, this will help me with continuing to raise awareness, fight to get organ donation into the school’s and universities curriculum’, and bringing in ‘opt-out’ into the UK. It should also help with a new business I have started in Georgia’s memory – Georgia’s Party Costume Hire. What do you hope Georgia’s song will achieve? I feel very strongly about the need to raise awareness of the importance of organ donation – the recent death of Erin Bonar (five-year old girl who died a few months ago, saving four lives) has further highlighted the issue. This beautiful five-year old saw an advert on TV regarding organ donation and had a discussion with her parents. These were Erin’s (aged only 5!!) exact words while she was 100% healthy and never been seriously ill in her life: “If something happens to me mummy, please give my organs away if it means you can save other lives”. What an amazing, wonderful, beautiful girl! I believe that people need to make this an important topic for conversation within families. It is such a shame that people are dying needlessly because others have just not taken the time to give this issue consideration. I am sure that a great deal of us would want to be able to save lives after ours has ended – just as we would want ours to be saved, if possible or necessary, by receiving a donated organ. If Erin and Georgia can, so can we! It goes without saying that we continue to be driven to raise money for the PICU at KCH (Georgia Sandy Fieldsend Fund) who provide the most amazing service to these very critically ill children. To keep a child alive in this unit costs a great amount on a daily basis, and therefore the need to raise funds is urgent and ongoing. Releasing Georgia’s Song to the public is not only a way to raise the importance of organ donation while raising funds for the Georgia’s Fund, but it is also a way of keeping Georgia’s memory alive, giving her a continued presence in the world that she left all too soon. For less than £2 the public get to donate to a really worthwhile charity, help raise awareness of organ donation which will in turn save many other lives, keep the memory of Georgia alive, AND get two versions of a beautiful song! Tell us about the business you’ve set up in memory of Georgia. After Joshua was born, I decided to resign from my job as an Air Traffic Controller as I had the fortunate opportunity to stay at home and be with my children. I am so grateful for every day I have spent with my them, especially now. With Joshua going to school soon, I have been thinking about whether to go back to work. But one night, after Georgia’s fourth birthday this idea hit me. What would my daughter like? What would she be proud of? How can I raise awareness of organ donating? What can I do to bring more happiness to lots of children and families while continuing to raise money for children who are in need of care and medical treatment? And then it came to me! Hiring out character costumes to bring fun and excitement to children’s parties – knowing that parents will see their child’s sparkly eyes and ear-to-ear smile, something that instantly warms your heart! So this is why I have set up Georgia’s Party Costume Hire. 10% of all proceeds go to the Georgia Sandy Fieldsend Fund (for the Thomas Cook ward for children’s critical care at KCH). How can anyone who wants to help get involved? Buy Georgia’s Song this week! Every penny goes to the Georgia Sandy Fieldsend Fund so the more people who buy and hear it, the more people we can help. You can buy it here on iTunes, here on Amazon and here on HMV. 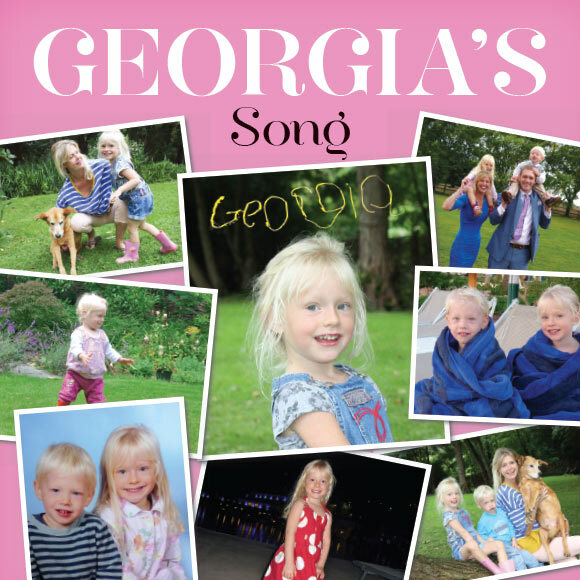 You can like ‘Georgia’s Song’ on Facebook, follow us on Twitter, and watch, like and share Georgia’s Song on YouTube. If you wish, you can donate directly to Georgia’s Fund here.